Augmented analytics automates the data insights by utilizing machine learning and natural language generation for automating data preparation, data discovery, and insight sharing. It embeds artificial intelligence in business intelligence tools to make the analytics work easier for citizen data scientists and other business users. It helps expert data scientists in focusing on specialized problems, provide most relevant actionable insights to decision makers, and reduce the time spent on exploring data. Rise in need to democratize the analytics and increase productivity, growth in awareness of enterprises to utilize growing streams of data from various sources in innovative ways and increase in need to make the work easier for citizen data scientists and business users are some of the factors driving the growth of the global augmented analytics market. Currently, the adoption of augmented analytics is major in BFSI industry. 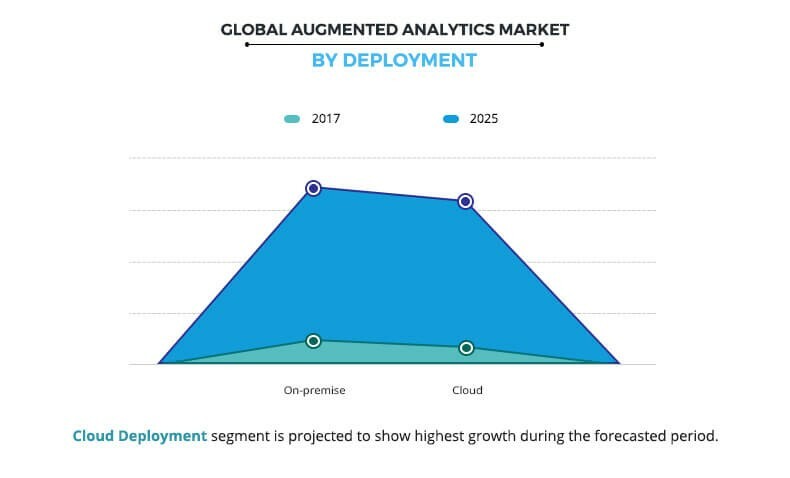 The global augmented analytics market size was valued at $4,094 million in 2017, and is projected to reach $29,856 million by 2025, growing at a CAGR of 28.4% from 2018 to 2025. North America dominated the overall augmented analytics market share in 2017, due to early adoption of AI-driven analytics and rising augmented analytics market application in business intelligence. The report focuses on the growth prospects, restraints, and augmented analytics market trends. The study provides Porters five forces analysis of the augmented analytics market to understand the impact of various factors such as bargaining power of suppliers, competitive rivalry, threat of new entrants, threat of substitutes, and bargaining power of buyers on the augmented analytics market growth. 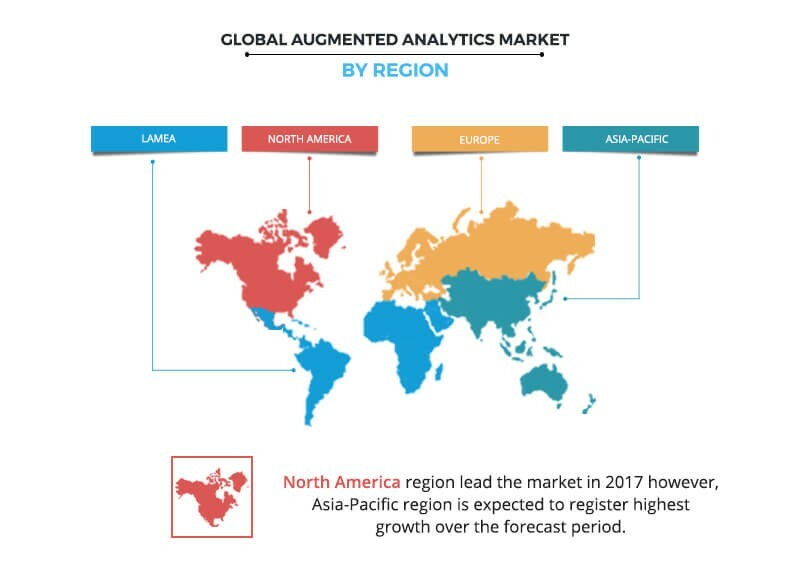 The global augmented analytics market is segmented based on component, deployment, analytics type, application, end user, and region. In terms of component, the market is bifurcated into software and services. On the basis of deployment, it is fragmented into on-premise and cloud. Depending on organization size, it is segregated into small- and medium-sized enterprises (SMEs) and large enterprises. By business function, it is classified into sales & marketing, finance, IT, operations, and others. By industry verticals segment, it is divided into retail, healthcare & life sciences, BFSI, telecom & IT, manufacturing, government, transportation & logistics, and others. Region wise, it is analyzed across North America, Europe, Asia-Pacific, and LAMEA. The key players operating in the global augmented analytics market analysis include IBM Corporation, Qlik, Tableau Software, Tibco Software, Salesforce, Sisense Inc., SAP SE, SAS Institute, Microsoft, and ThoughtSpot. Rise in need to democratize the analytics, increase productivity, and increase in need to make the work easier for citizen data scientists and business users are expected to drive the market growth. However, security concerns related to critical data among different industry verticals is expected to restrict the growth of this market. The huge amount of data is stored in organizations and to convert that raw data into actionable insights, certain technical steps are needed to be taken. These analytical skills are only performed by hiring the dedicated individuals usually called as data scientists or data analysts. However, there is scarcity of data scientists which restricts the organizations, especially, smaller businesses to leverage the advantage of actionable insights generated by utilizing the analytics. For instance, the U.S. economy alone could be short as many as 250,000 data scientists by 2024. Thus, organizations face the need for democratizing the analytics and increase their productivity. This can be possible by utilizing artificial intelligence, machine learning, and natural language generation, which generates automated insights for any non-technical user. One feature of augmented analytics which is different from other technologies is the ability to carry out natural-language generation, which undoes complex jargon and delivers insights in simple terms. Similar to self-service BI, augmented analytics and smart data discovery technologies will enable humans to interact with data using conversations. Citizen data scientist create or generate models that use advanced diagnostic analytics or predictive and prescriptive capabilities, but whose primary job function is outside the field of statistics and analytics. Analytic and BI tools are extending their reach to incorporate easier accessibility to both data and analytics. Technology developments include augmented analytics that incorporate ML capability to automate data preparation, insight discovery, and data science. Thus, these technological developments including augmented analytics make the work of citizen data scientist and business users much easier, which in turn is expected to drive the growth of the global augmented analytics market. In practice, data scientists spend over 80% of their time doing simple mechanical things such as labeling and cleaning the data. This time can be reduced by using augmented analytics. 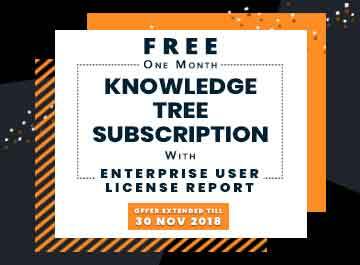 It is designed to conduct analysis and generate business insights automatically with minor or no supervision and can be used directly by business users without assistance of a business analyst or data scientist. It relieves the companys dependence on data scientists by automating insight generation. The data security and privacy management are one of the biggest concerns of organizations from various industry verticals such as BFSI, healthcare, IT, and others. Organizations have to face ethical, legal, and regulatory challenges with data governance, due to complexities in data management. Thus, industry verticals are hesitant while adopting big data analytics solutions, especially when they are not on-premise solutions. This study presents the analytical depiction of the global augmented analytics market along with the current trends and augmented analytics market forecast to determine the imminent investment pockets. The report presents information related to key drivers, restraints, and augmented analytics market opportunity. Porters five forces analysis illustrates the potency of buyers & suppliers in the global augmented analytics market. 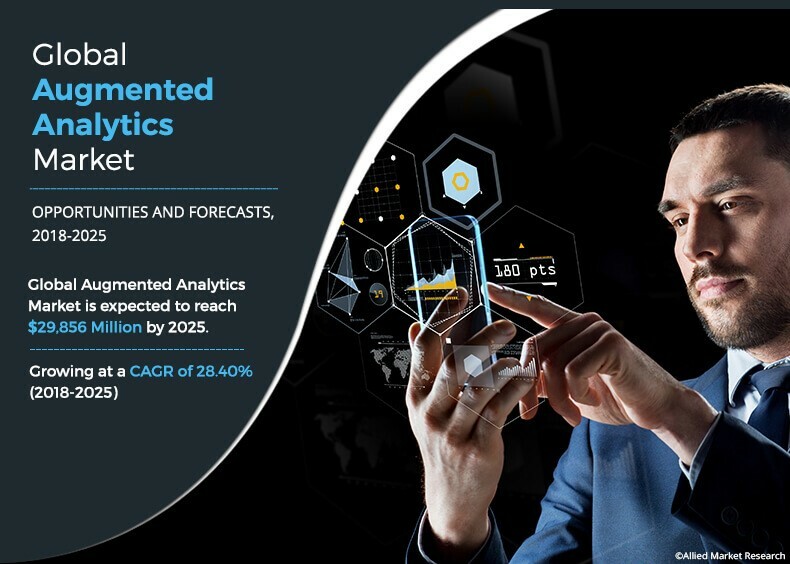 Augmented analytics can be defined as the paradigm to automate the insights by using artificial intelligence (AI), machine learning, and natural language generation. It comprises data preparation, augmented data discovery, augmented machine learning, and data science. The global augmented analytics market is projected to witness significant growth, especially, in Asia-Pacific due to rise in adoption of AI in business intelligence in this region. The market is projected to grow at a CAGR of 28.40% from 2018 to 2025, owing to rise in need for democratizing the data analytics for making the work of citizen data scientists and other business users much simpler and increasing adoption of modern technologies in data analytics. Vendors operating across the augmented analytics market are concentrating on bringing interoperability and accuracy through AI driven data analytics. Furthermore, the market is witnessing the trend of building solutions designed for specific business functions such as sales & marketing, IT, finance, and others to cater the challenging requirements in the related sector. This is anticipated to boost the growth of the market during the forecast period. In addition, augmented analytics, will soon be a prevailing driver of new purchases of business intelligence tools, embedded analytics software, and data science and machine learning platforms. The key players profiled in the report include IBM Corporation, Qlik, Tableau Software, Tibco Software, Salesforce, Sisense Inc., SAP SE, SAS Institute, Microsoft, and ThoughtSpot. Key market players have adopted various strategies such as merger & acquisition or strategic alliance with start-ups and well-established players to expand their market presence and enhance their product portfolio.